I had a hard time choosing from all of the quilts I have completed since the Fall Festival HERE. And I know that I probably will say..oh, I wish I had picked the other one. 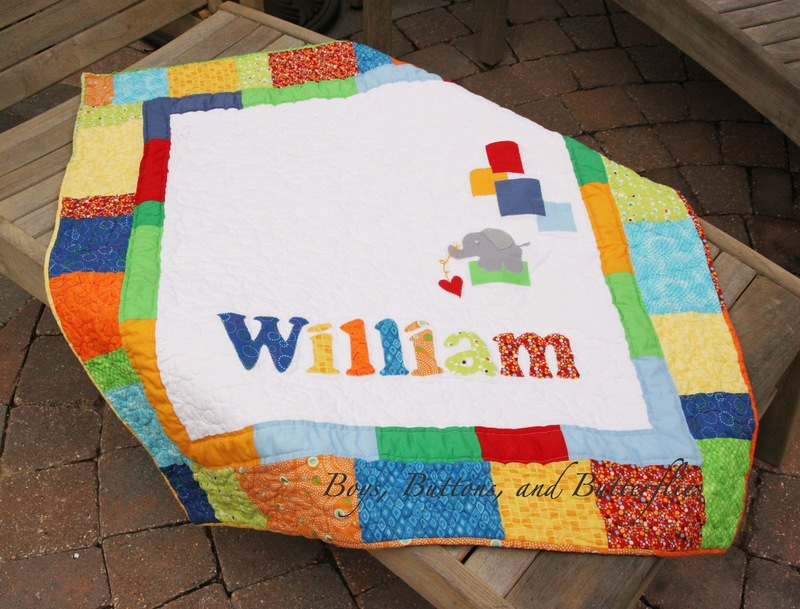 Baby William's quilt story won out! 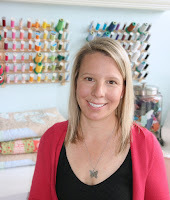 My regular followers followed along with me as I struggled to find the most perfect quilt pattern for such a special little boy. A very good friend of mine contacted me in early January. A friend's daughter had just found out that their baby was diagnosed with a serious, possibly fatal condition. For me, it hit home because I know what that journey is like HERE. She was due any moment, and actually went into labor while I was making it. A good friend quickly directed me to a great pattern when I hollered for some help HERE. What do I love about this quilt? The fact that it was made completely by all of my scraps. The Elephant applique holding momma's heart. I sure love the blanket stitch and the hand embroidery. My long arm machine, Ole Betsy was really good to me. Loops and some straight lines. She really made using minky as a backing a breeze!!! Scrappy binding rolled up in the classic blogger binding shot. And a special label just for mom. The quilt was whisked off by my friend straight to mom, who cuddled it when she was home while he was in the NICU. Sadly, Baby William is an angel now...but her mom is so glad she has the quilt...which reminds me why I love quilting so much. Linking up with Amy's Creative Side. Please take some time and check them out. Even if you aren't a quilter, there are some wonderful works of art and amazing stories to go with it. I am vastly worried that I will be following more blogs than I can read. But I just can't help it! Thanks for sharing such a lovely quilt and the story. Oh my. I think the quilt is absolutely adorable. I bet it gave the mom great comfort in a just awful time for her. Quilting is a gift to us as quilters. We have good way to give someone TLC when there is little else we can do for them. The momma just emailed me the other day again! It is definitely a way for us to have a tangible item to remember them!!! Oh my, how darling! 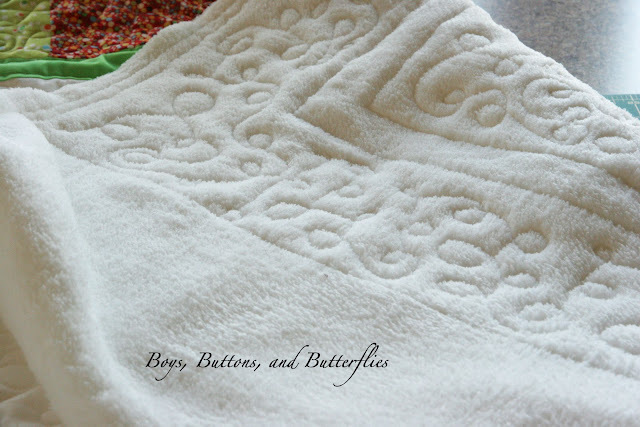 I am absolutely swooning over the details in this quilt. And what a quilt story - I'm speechless... I hope it brings Mom comfort for years to come. awww, that elephant is so cute! 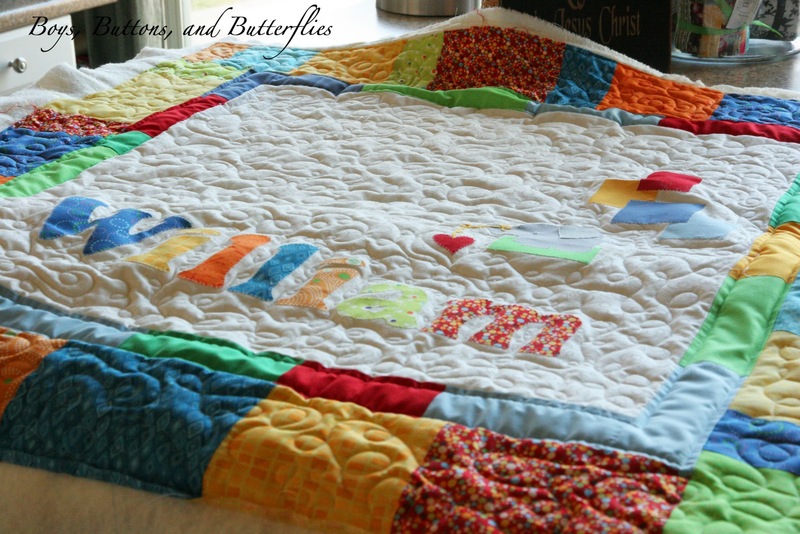 What a great baby quilt! 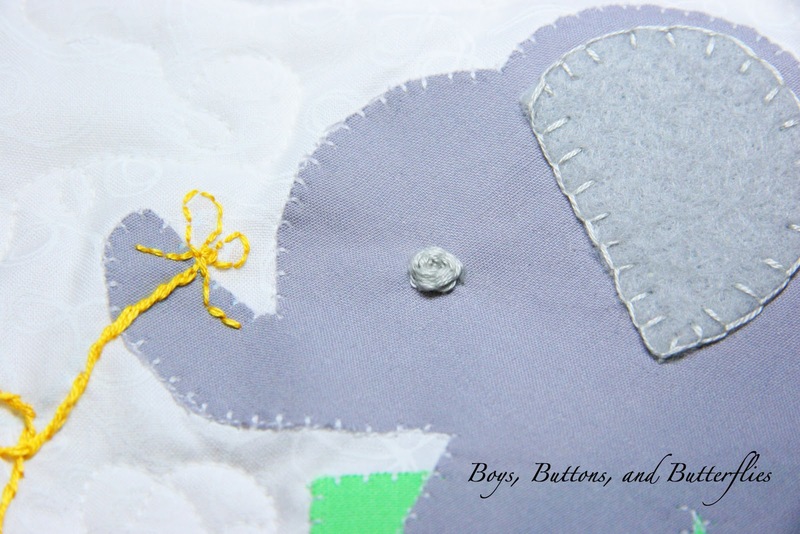 I really love the elephant too....He sorta makes the whole quilt for me! Beautiful quilt, hope mom gets comfort for many many years. So often the quilt catches your eye, and then story behind it catches your heart. This is a prime example of that. Ohhhhhhhhhhhhhhh this is just so sweet; the quilt and the story behind it...great job! So sweet - love the elephant! Such a sad story but you added sunshine with your beautiful quilt. Beautiful quilt made by a beautiful mama for a beautiful baby. I just love all that you do Heidi! I have a quilt like that in my history of quilting and it stays near and dear to my heart, reminding me regularly of why I quilt and why I love giving a quilt. 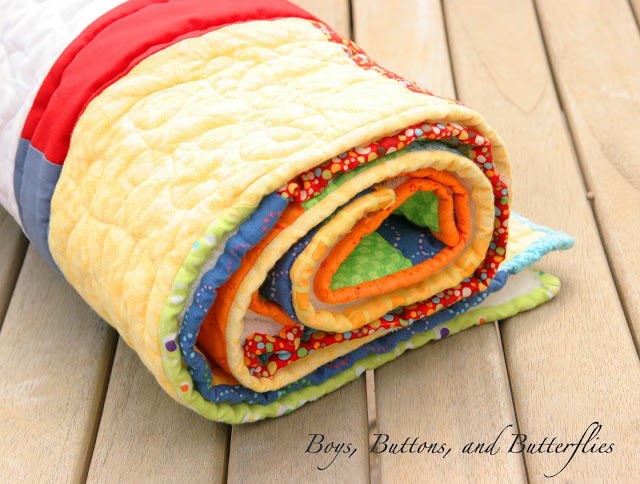 This is a great little quilt, beautiful and the minkee is a nice touch to give mom cuddle time when she needs it. What a beautiful gesture, and a lovely quilt that you made. I am almost speechless. Your stories, both this one about William and the one about Jamie Lynn, are so touching and so beautiful. Thank you for sharing this gorgeous little quilt. It means a lot to me that you have read their stories. Sharing them is so important to us mommas!!! You did have a hard choice picking just one out of your collection of beautiful quilts. You warm my heart and bring tears to my eyes with your stories. I love everything about this quilt!! so beautiful, and so meaningful. I loved this one the first time and I love it still! I think you picked well for the festival! It's beautiful! It's so bright and cheerful and I love the elephant. What a sweet remembrance your friend will always have of her son. Thanks. I am so glad I was able to finish it in time! 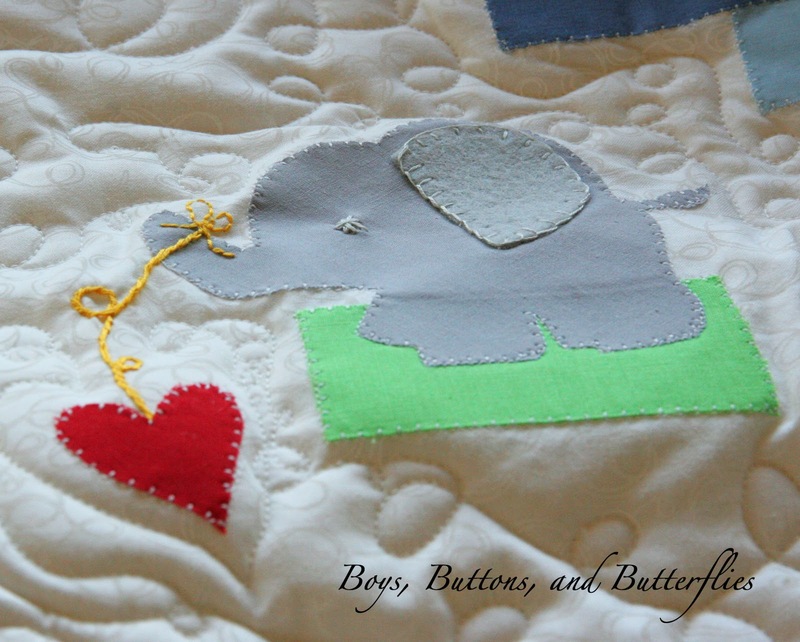 This is such a special quilt for such a sweet little bundle...you did a fabulous job...that elephant is just too cute! 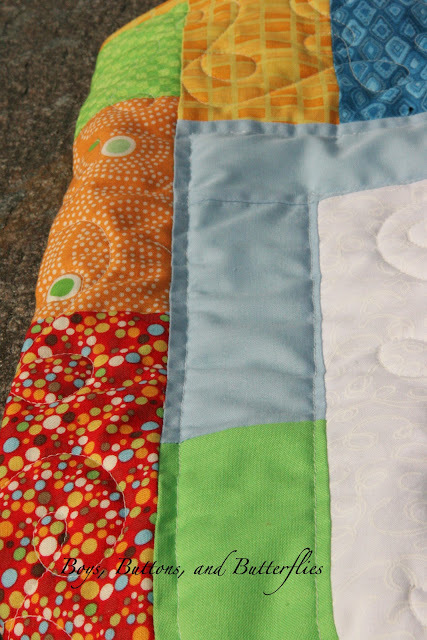 The quilt is amazing and something your friend will cherish. Thank you for sharing this beautiful quilt and the story of your friend and her sweet baby angel.